Mail Call and here comes the Memoria Press magazine! This magazine, which includes interesting articles about education, mostly, of course, stemming from a classical approach to learning, stirred an interest in the Memoria Press program Prima Latina Complete Set, which is why we were so excited when the opportunity to review the product was offered. Latin, we all know, is quite the dead language; however a study of history and languages reveals that many “alive and kickin'” languages are based upon this ancient, romantic language. In fact, The five most widely recognized languages, Spanish, French, Romanian, Portuguese, and Italian, stem from the Latin form. Learning Latin, could therefore, positively impact the ease of learning other languages. But not just foreign language learning, but…. How many of you took notice of the National Spelling Bee championship? Knowing the origination of words, which many times is Latin, can significantly aid Spelling efforts. In fact, in our first lesson with Prima Latina Complete Set, we learned that our English word “ambulance” is derived from ambulo in the Latin form! Also, think of all those scientific and mathematical terms you learned in school. Animal Classification, angle, and acute all maintain a Latin influence. With these above reasons, and, no doubt many others, the study of Latin can surely be of benefit to the young student. What is Prima Latina Complete Set? Prima Latina Complete Set is a beginning Latin course written by Leigh Lowe and published by Memoria Press. It is designed for the young student, perhaps first grade through third grade, who possesses a confident grasp of English phonics, reading and writing. The program is structured around a Christian thought, with many words being religiously based and even including many Latin prayers to memorize that Christians in ages gone by would have recited. This Christian approach to language learning is refreshing and encouraging, considering that most early language learning is based on a secular approach and therefore omits the learning of any Biblically-based words. Since, personally, our purpose in education is to determine and develop talents in our daughter that can be effectively used in service for the Lord, Prima Latina Complete Set, a Christian approach to language learning only further aids us in our educational goals. 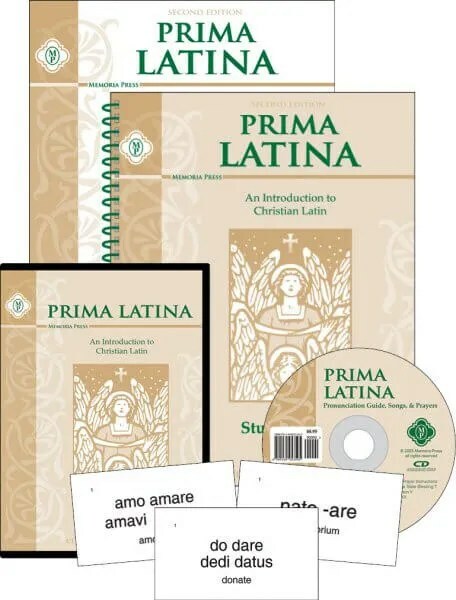 What course material is available for Prima Latina Complete Set? The Student Manual – a spiral bound workbook (consumable) that includes all lesson material and space for practicing vocabulary and other questions. Instructional DVD – The author, Leigh Lowe, teaches each lesson in 15 minute increments. The DVD is a MUST to adequately work through this program. As we worked through this program, it was clear that the DVD instruction by Leigh Lowe was invaluable. Although a basic recording, the teacher does an excellent job explaining, clarifying, reviewing, and giving good pronunciation examples. For our daughter, who is just entering first grade and used to DVD instruction for school, this was an easy addition to her learning; however, she did find the DVD instruction a bit “boring” at times due to the simple lecture-style production. Nevertheless, the instruction was precise and the time-frame just enough that she was able to continue through the program and get excited about learning Latin! For our soon-to-be first grader, the workbook was also age-level appropriate with moderate assistance. We found that completing a little at a time was sufficient for learning the beginning Latin skills. With 26 lessons, you can easily work through a lesson a week, covering the course in a school year. What an opportunity to learn Latin! Yes, it is possible with Prima Latina Complete Set! And, of course, it doesn’t need to stop there. Memoria Press offers Latina Christiana for upper elementary grades and the First, Second, and Third Form (sets) for middle and high school. Then for those interested in other religious pursuits, Biblical Greek is also available. As the saying goes: “Once a student, always a student!” We should always be studying to shew ourselves approved unto God and developing that love for learning new things within our children.